Super comfy everyday flip flop. Polyproplene straps with polyester lining. Genuine leather footbed. Durable rubberized EVA outsole. Soft fast-drying straps. Made in Israel. Each pair comes with an Eco Logic Carry Bag for easy packing even when your sandals are wet or dirty. Free your feet and follow your heart. SOURCE was founded in 1990 by Yoki Gill and Daniel Benozillyo as a single sewing machine operation in a one bedroom apartment. Today, SOURCE BY NAOT is a worldwide company employing more than 250 people in a 75,000 square foot facility in Tirat Carmel, Israel. All SOURCE BY NAOT sandals are handmade to last by people with a passion, people who put their personal touch on every product they make. SOURCE BY NAOT is committed to satisfying the genuine needs of those who inhabit the outdoors by bringing innovative, function, and long-lasting gear to the marketplace. •	X-STRAP: Exclusive strapping system with six anchoring points holds the foot securely. •	TRIPLE-LAYER SOLE: Three separate layers for foot contact, cushioning and ground contact. •	A.R.T: Advanced Rubber Technology ensures the highest standard of performance, exceptional grip and comfort on all surfaces. •	EDGE LOCKER: Designed to secure the strap's edge and prevent unwanted opening of the Velcro closure. •	TRIPLE-LAYER PADDING: High quality materials layered on on top of the other in a stitch and turn method resulting in a clean cut look with the most comfortable padding experience. •	GRUNGE GUARD: Integrated permanently in the upper sole, the Grunge Guard keeps feet cool and dry and helps prevent sandal stink. •	RIGHT/LIGHT WEIGHT: A good outdoor sandal is about the balance between sandal weight and sandal durability/performance. 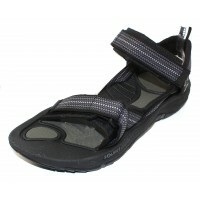 •	SLIP-ON OPTION: By routing the heel strap around the forefoot strap, your sandals easily convert to a slip on. •	WET CROSS: A non-velcro one tug strap system that secures the foot during the most extreme water sports. •	ECO LOGIC CARRY BAG: Perfect for clean, easy packing, even when the sandals are wet or dirty. •	CARE & MAINTENANCE: Being amphibious, SOURCE BY NAOT models that do not contain any leather components, are completely hand and machine washable. They will dry quickly and look like new! We recommend to occasionally open all three straps and hand brush or machine wash them in warm soapy water. Washing your sandals will refresh their feel and look without reducing their ever-lasting qualities. Super comfy everyday flip flop. Polyproplene straps with polyester lining. Genuine leather footbed..